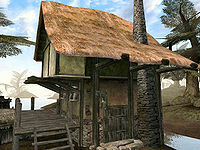 Arrille's Tradehouse is the only shop in Seyda Neen, located by the bridge in the center of town. Arrille and his guests provide all the services that are available in town, save for transport. In addition to Arrille's wares, there are two trainers located here, one of whom is a Blades trainer that Caius Cosades will recommend to you. The tradehouse is divided into two unconnected sections. The main area is publicly accessible and contains all the NPCs in the building. In the bedroom upstairs, behind a locked door, one will find: a locked low quality chest, a steel dagger of swiftblade under the bed pillow, and an Imperial newtscale cuirass under the bed. In addition, there is a storeroom, accessible only from the outside via a locked door, for which there is no key. Most of Arrille's wares, as well as two units of moon sugar are stored here, and completely unguarded, provided you can break in undetected. A standard Fortify Luck potion is hidden behind the crates against the wall.